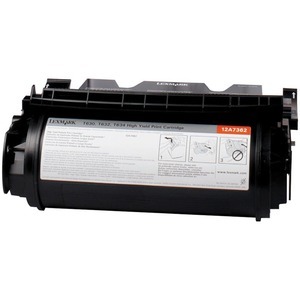 High-yield toner cartridge for label applications is designed for use with Lexmark T630, T630dn, T630n, T632, T632dtn, T632dtnf, T632n, T632tn, T634, T634dtn, T634dtnf, T634n, T634tn, X630, X632, X632e, X632s, X634dte and X634e. Toner delivers outstanding results page after page. Superior Lexmark design means precision pairing between printer and cartridge for value, quality and environmental responsibility you can count on. Lexmark Return Program Cartridges are sold at a discount vs. the prices of regular cartridges, in exchange for the customer's agreement to use the cartridge only once and return it only to Lexmark for remanufacturing or recycling. Cartridge yields approximately 21,000 pages. The Extra High Yield print cartridge for label applications includes Lexmark designed oily fuser wipers to ensure you receive optimal printer performance for your label printing. Lexmark T630, T632 and T634 supplies are not compatible with other Lexmark Printers.